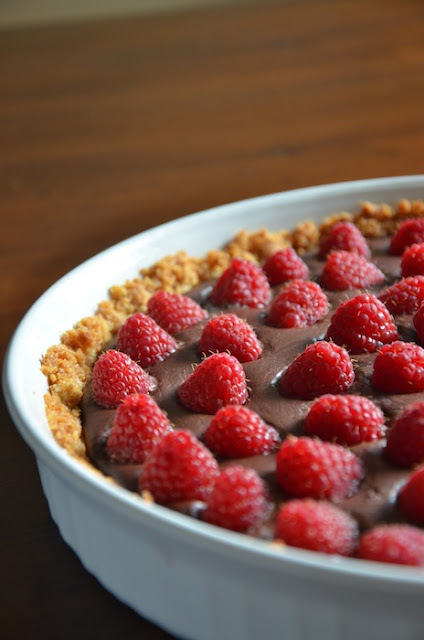 A couple of weeks ago the June issue of Coastal Living arrived in my mailbox and as usual I immediately flipped to the recipe section to find a perfect looking strawberry-chocolate truffle tart. I had to make it, so last week I went out to get the ingredients, but finding nice looking, none smushed or on the verge of rotting strawberries proved to be a challenge. Two grocery stores later, I decided to improvise with raspberries and thus I present the raspberry truffle tart. It is so easy to make and takes no time compared to the hours long process of my hazelnut truffles. 2. Press the cookie mixture into an ungreased nine-inch tart pan and bake for seven to ten minutes. Then set it aside and let cool completely. 5. Arrange raspberries on top of the chocolate and chill tart until firm. PS. You can expect to see some changes around here in the next couple of weeks.